We normally wouldn't update the Governor Line again until the weekend, but with Lieutenant Governor Jane Norton's announcement today that she would not seek the office in 2006, we made some adjustments. You can read Sunday's changes HERE. Norton drops off the list altogether, obviously. In other news, Mark Udall gets himself a nice blue arrow for meeting with Denver Mayor John Hickenlooper last week to talk about the office. State Senator Tom Wiens gets a downward red arrow for his reported interest in running for congress in CD-5 should Joel Hefley retire (see post below). Republican congressional hopefuls are popping up like groundhogs after last week's report here that Congressman Joel Hefley (CD-5, Colorado Springs) may retire after his current term. State Senator Tom Wiens, whose name has been floated as a possible gubernatorial candidate, is now considering running for Hefley's seat if the 20-year veteran chooses to retire. Former Speaker of the House Lois Spradley and former House Majority Leader Keith King are being talked up around the state capitol, and House Minority Leader Mark Hillman has already been making calls to feel out support for the race. At least five other Republicans are known to have expressed some interest in running for the seat, and TABOR Daddy Doug Bruce is even thought to be in the mix. Remember that in Colorado, candidates for congress don't need to actually live in the district to run, so there's no limit as to how many Elephants could throw their names into this quickly growing hat. "I have greatly enjoyed serving the people of Colorado over the last six years, four as Executive Director of the Colorado Department of Public Health and Environment, and for the past two years as Lieutenant Governor. I look forward to serving with Governor Owens, the legislature, and other elected officials on behalf of all Coloradans over the next two years in my capacity as Lieutenant Governor. However, I will not be a candidate for Governor in 2006." This comes as no real surprise to us at Colorado Pols. It had been rumored for more than a week that Norton would not seek the position, and with Governor Bill Owens' fading star in Colorado, she wouldn't have been the frontrunner on the GOP side, or anywhere close to it. In fact, had she chosen to run, Norton would have had trouble cracking the current top two of Marc Holtzman and Mike Coffman. It looks like freshman Congressman John Salazar already has an opponent for 2006. State Representative Joshua Penry, who bills himself as a "Citizen Legislator" while representing Delta and Mesa Counties, is preparing to challenge Ken's older brother. Penry is considered to be personable and very bright, and will be extremely well-funded. Penry doesn't carry the baggage that Salazar's 2004 opponent lugged around, either. If John Salazar is re-elected it certainly reflects well for the Salazar Machine, but his race will put pressure on Ken. If John loses in 2006, the vultures will start circling around Ken well before 2010. UPDATE: Here's Josh Penry's state house campaign website. 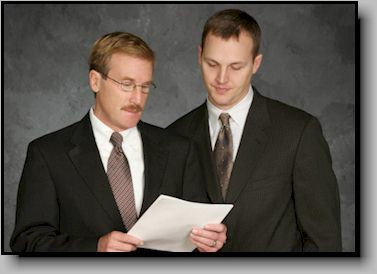 You've gotta love this incredibly goofy glamour shot picture of Penry and former Congressman Scott McInnis at the bottom of the website; they look like they're getting ready to shoot a late-night ad for ambulance chasing attorneys. "Have you been in an accident..."
The Boulder congressman, who has been coy about his intentions, met privately last week with Denver Mayor John Hickenlooper, possibly to seek his support. Udall also apparently met with U.S. Sen. Ken Salazar. It's doubtful that Udall's conversation with Hickenlooper was about asking for his support; more likely, Udall wanted to know if Hick was planning on running himself. Meeting with Ken Salazar doesn't mean a whole lot, either. Salazar will likely stay out of this until the field has been cleared for one Democrat - he's not going to get involved in a primary fight. It's interesting to see that Udall is back in proactive mode. Many party insiders were beginning to suspect that Udall wasn't interested after all. One thing that may be taking him back to the idea is the bigger picture: if Udall were to run for governor and win, and Colorado maintained its Democratic majority in the legislature, he would immediately move to the top of the list of future presidential candidates. That's an awfully big carrot to ignore. On another note, the Post reports two things that Colorado Pols readers already knew: that State Senator Tom Wiens is thinking about a gubernatorial run, and that Peggy Lamm is seriously considering a run for congress in CD-7. Norton's title makes her the likely front-runner, but she hasn't been acting like a candidate. Sorry, but Norton would not be the frontrunner if she decided to run, which is probably a big reason why she's leaning against taking the plunge. Norton's gubernatorial aspirations were tied to Bill Owens' performance, and when the Republicans lost the legislature Norton lost her place at the head of the line. We're moving up millionaire Rutt Bridges because it looks pretty clear that he's going to be running if Denver Mayor John Hickenlooper decides against it. That's not big news, obviously, but it looks more and more as if Rutt is already running. He's been giving speeches around the state, first to the Fremont County Democrats and on Saturday to the Jefferson County Democrats, and apparently he's had paid staff members with him who have been videotaping the speeches. Clearly, they're working with Rutt on improving his speaking and his message. Former Senator Ben "Nighthorse" Campbell moves up a little because he got a glowing story in one of the Aspen newspapers two weekends ago. Here's why that matters: if the Aspen money people are still waiting on Nighthorse because they like him, he has a lot of leverage in this race. We don't forsee a scenario by where he's still on the ballot in November 2006, but he'll no doubt try to muck things up in his favor if he can. Congressional members Marilyn Musgrave, Joel Hefley, and Tom Tancredo keep falling down the line. Musgrave was recently named one of the GOP's most endangered congressional candidates, so she'll have a hard enough time just keeping the seat she has. As any reader of Colorado Pols knows by now, Hefley is likely to retire. As for Tancredo, "President, here I come!" Looking for the poll? We moved it HERE. Peter Blake of The Rocky Mountain News wrote on Saturday that Peggy Lamm is seriously considering running for congress in CD-7 against Bob Beauprez, which is something Colorado Pols readers have known for weeks. We've also been told that former Jeffco District Attorney and wild west sheriff lookalike Dave Thomas is seriously considering another attempt at CD-7, and by some accounts is even starting to raise money. Thomas has run for congress three times in his political life, and been soundly beaten three times. In fact, 2004 was the first time he even made it past the Democratic primary. There's something to be said for never giving up, though in Thomas' case that may not apply. As if that isn't enough, we hear that Joanna Conti, who was soundly trounced by Tom Tancredo in 2004, is telling folks that she wants to run again in CD-6. Conti raised nearly a million dollars, but was such an inept campaigner that she barely managed to get more votes than the guy who ran in 2002 and didn't even bother to campaign; Lance Wright was a guy who just let the Democrats put his name on the ballot and didn't even make an attempt at winning. If Conti wants to try again, it really doesn't matter, because CD-6 is a Republican seat and will be for awhile; even a good candidate would have a tough go of it. Longmont Wal-Mart Workers Reject Union...Or Do They? Keep an eye on this story from 9News.com, because the repurcussions could be felt nationwide. Wal-Mart workers reportedly rejected a plan today to form a union at the Longmont Wal-Mart Tire-and-Lube Express, by a vote of 17-1. The results seem a little odd, and the local branch of UFCW plans to challenge the election. Why would they even bother to go to a vote if nobody wanted it to begin with? What ultimately happens here could effect how Wal-Mart operates nationwide, and a unionized workforce of the largest employer in the U.S. would certainly benefit Democrats in future elections. In the next few weeks, some of the top Democrats in Colorado will be busy running around the state speaking to various county parties. Rutt Bridges, who has already spoken to the Fremont County Democrats, will be the featured speaker for the Jefferson County Democrats on Saturday at one of their annual fundraising dinners. Then, on March 12, Congressman Mark Udall will be a special guest at the El Paso County Democrat's St. Patrick's Day fundraiser. For those of you unfamiliar with geography, Udall's district is nowhere near El Paso County. It's no surprise to see Bridges out and about, since he's the next likely Democrat to run for governor should Hickenlooper decide against it. What's more interesting is to see Udall running around; most likely this was scheduled awhile ago, but maybe Udall is still keeping one eye on the Governor's Mansion after all. Should Denver Mayor John Hickenlooper decide to run for governor and win, and he is currently at the top of our odds list, somebody is going to have to replace him as mayor. There will be no shortage of candidates, and some are already making their desires known. Denver City Attorney Cole Finegan reportedly has his eye on the seat, and friends of his are quietly planning scenarios whereby Hick would appoint Finegan as Deputy Mayor, allowing him to run for re-election in May 2007 as acting mayor. Could Finegan pull it off? Well for starters, he'd have to be a better candidate than he was a campaign manager. Some supporters of former Denver District Attorney Norm Early still blame Finegan for mis-managing Early's campaign for Denver Mayor years ago. Democratic political advisor Mike Stratton also places some blame for Tom Strickland's two U.S. Senate losses on Finegan. If Hick runs for governor, the line for his seat could grow to as many as 10 names. It would be a hoot to see the cluster of candidates running for mayor if Hick were elected governor.